Hartsfield-Jackson International Airport is the busiest airport in the world. As one of the pillars of the Atlanta business community, the airport has a $3.48 billion impact on the economy while also supplying the city with 63,000 jobs. However, the neighborhoods surrounding the airport haven’t received the same attention and development despite being so close in proximity to one of the largest economic drivers in the city. Aerotropolis Atlanta wants to change this trajectory. Since its formation in 2014, Aerotropolis Atlanta has had a new vision for metro Atlanta’s southside, the community surrounding Hartsfield-Jackson International Airport. Leaders from local businesses and city governments have partnered to develop the area into a preeminent location for economic development. In order to improve and sustain the quality of life for those who live, work and play here, Aerotropolis Atlanta is focusing on workforce development, education and economic development. “Just as we have the model world-class airport, wouldn’t it be wonderful to have the model world-class community?” said Carol Waddy, director of community affairs at Chick-fil-A. Chick-fil-A, Delta Air Lines and Porsche North America are just a few examples of large corporations that have headquarters located in south Atlanta. Businesses like these have partnered with Aerotropolis Atlanta to give back to the neighborhood located in their backyard. The cities of College Park, Chattahoochee Hills, East Point, Fairburn, Forest Park, Union City, Hapeville, Morrow and Palmetto have come together with the private sector to work on several projects that are enhancing public safety, improving the physical environment and strengthening the urban amenities that give the area its unique character. 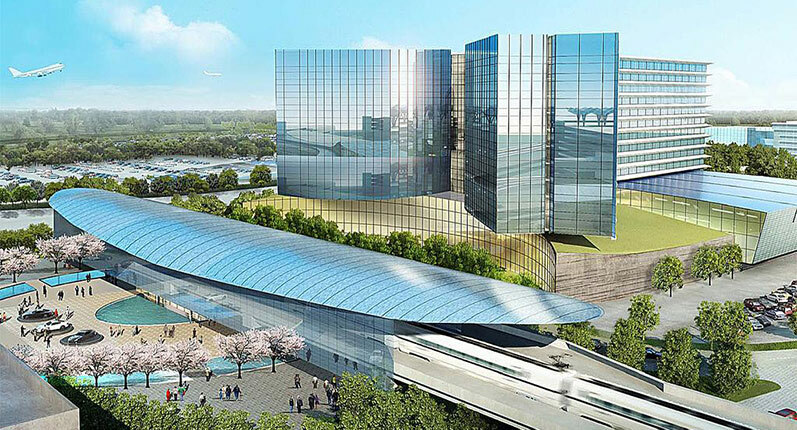 One of the largest developments in the area is the massive 320 acre mixed-use “Airport City” being constructed in College Park. The estimated $500+ million project will have residential housing, office space and retail components. Phase one is expected to bring around 5,000 jobs to the area. Another Aerotropolis project is the redevelopment of the Fort McPherson community in Atlanta. The former U.S. military base was built in 1885 and closed in 2011. Four years later, filmmaker Tyler Perry closed on his purchase of 330 acres of the post for a sprawling new film and television studio. The current proposal includes the studio, as well as office, commercial and residential spaces. Not only will this contribute to the booming Georgia film industry, but it will be a huge investment in the community. The revitalization of metro Atlanta’s southside is being modeled after similar efforts conducted in the Westside Atlanta community by organizations such as the Westside Future Fund. One major difference in the work here is the presence of Hartsfield-Jackson International Airport. Having the airport in this Southside community presents great opportunity for the people and neighborhoods that surround it to grow and thrive. Aerotropolis plans to continue its progress, creating a brighter future for the southside and for those who live there.